Ignore the basic decor, just taste the pho noodle soup at this Vietnamese hot-spot in the unlikely setting of a car park. Once you’ve managed to find Café East – tucked in a far corner of the car park of the huge Surrey Quays Shopping Centre – you might well think you’ve happened upon a South-east Asian workers’ canteen. It’s effectively one big room, with cream-painted walls but absolutely no attempt at decoration. The big utilitarian square tables are a little too high for the chairs, and are packed with happily guzzling South-east Asian customers. The menu is an edited-down list, each dish portrayed in an adjoining colour pic: a handful of starters, lots of substantial bowlfuls, some side dishes and a few soft drinks (but no alcohol). The herby summer rolls were a joy, and the beautifully flavoured pho with slices of beef, chicken and prawns was all it should be. Not only is the food impressive and authentic, it’s inexpensive too, making this an ideal place for groups to enjoy a veritable Vietnamese banquet. Two points to remember: staff don’t supply tap water, only bottled; and if you’re walking or driving here, it’s best to enter the car park via the little (quite hidden) entrance after the main route into the complex, Surrey Quays Road. Don't expect anything other than great, reasonably priced Vietnamese food. Love this place - mix of humble and tasty that absolutely works for me. Good food, not a huge menu but enough to please most tastes except vegetarians, brisk but good service. Well what is there more to say about this place other than it has possibly the best Vietnamese food I've eaten outside of Vietnam. The Pho is so good, and very reasonably priced. Don't come here expecting trendy street food style Vietnamese, this is true home style cooking, in the best way possible! You can tell it's good by the fact it's always rammed with people, whatever time you go! I've been coming here for as long as I can remember. It's one of, if not, the best Vietnamese places in SE London. Convenient to get to with ample parking, there's no excuse to not come here. The food is more home made style than the trending street food, but it's comforting and they haven't changed their menu at all, so they focus on their main dishes to make sure each dish is as good as ever. Don't expect great service here (as with most Asian places, customer service is not their strong point). There is a ramp, but also a step before it and the ramp is quite steep so wheelchair users will need a bit of help. However, there is another entrance around the other side which is accessible, but you need to let staff know so it's just easier to go down the ramp. There are no accessible toilets either, but the bowling alley across the car park has one if required. It's local and familiar with good food, so I'll be coming here for years to come. For the best Vietnamese in town head over to Surrey Quays. This used to be my local but now i happily trek across London to enjoy the beautiful and hearty Vietnamese cuisine. The place is always busy and most are happy to queue for a table. My favourite dish has to be the the Bahn Coun £6,80 per serving, the best I have eaten in London a steamed pudding pastry, topped with meatloaf and filled with mince pork and Chinese mushrooms. Served with the special Cafe East fish sauce. Whilst the do a great selection of soups based mains with a choice of noodles and meats or seafoods, the Kom curry £8,00 chicken cooked in a coconut cream with potatoes, sweet potatoes and carrot and the Bo Kho a slow cooked beef strew served with s baguette and steamed rice both @ £8,50. Another favourite amongst my friends is the BUN BO XAO £9,00 a fine vermicelli noodles topped with sweet stir-fried beef. Accompanied by sliced cucumber, a herb salad, pickled carrots, molly, peanuts, shallots, beansprouts and their signature fish sauce. Signage throughout the venue informs you that tap water is not served as they do not sell alcohol they are apparently not obliged to offer free water. So I suggest you buy yourself a refreshing coconut juice at £3,50. Unless you are really into your Asian desserts I tend to give these a miss, I did reluctantly give the colourful Halo halo a go but beans do not belong in s dessert. Pop into cafe east the next time you find yourself in Surrey quays . Closest station Surrey quays or Canada Water. You will find it located in the far right hand corner of the Surrey quays leisure park near the cinema and gala bingo. great tasting pho for the price. Usually fully packed no matter what time you go. The only downside is that it leaves you craving for more pho (and water as they do use MSG). Definitely a better alternative than the kingsland stretch though. Will be back! also, it is not the easiest to get to unless you have a car, but there is ample parking. Only ever been here the once. As @bowertron says, don't expect anything fancy. It's a canteen, the lighting is awful, the place isn't beautiful. 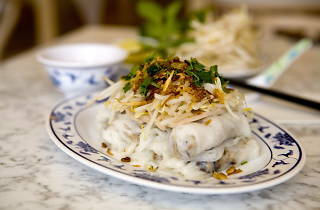 But the food is pretty good, and it often ranks as the best Vietnamese in London. Not a place to impress someone with your style, elegance and grace, but where you'd bring a food lover who doesn't give a sh*t about decor. So the outside looked nice, slight neon glow but that's okay. We went in and were rudly served with just 3 fingers up no "hello, how many of you?". Then we had what can only be described as salad in cling film, 6 pounds for six, weird texture. Did not finish. Then we had our mains, the beef my friend had was nice but very small amount and a lot of salad on the side. I had some donner meat in 'soup' which can only be described as spicy ginger water. Then my other friend had chicken with some rice with some scotch egg type meat pie. Again the meat was nice but such a small amount and that was all that was eaten. We ended up paying 20 pounds each, left feeling hungry. Also did not help a baby had an accident in front of our table and a brown stain appeared on the baby chair. IT WAS THE WORST SMELL EVER. The staff did nothing about it, I was gagging with the smell. 60 pounds for all three of us. AVOID IT WAS NOT WORTH THE TIME, OR THE MONEY. Way too expensive below average for that price completely. The iced coffee was amazing though. GO FOR COFFEE BUT THE FOOD HAS MADE US FEEL WEIRD AND WAS NOT EVEN TASTEY. WE PAID 20 POUNDS EACH TO FEEL WEIRD, STILL FEEL HUNGRY. AVOID!!!!!!!!!!!!!!!!!!!!!!!!!!!!!!!!!!!!!!!!!!!!!! The first reassuring sign about this restaurant is that more than 50% of the people who come out are… Asians. The second great sign is that if you go there when the sun is out, you can enjoy a special drink (containing coconut juice, or aloe vera, or those Asian-specialty jellies) at the outside tables (unfortunately they do not serve food outside). But let’s get to the most important point about Café East, which is the food. It is absolutely delicious, at a highly affordable price. We shared the summer rolls as a starter and the homemade peanut sauce that came with it was just a “wow” factor. Then we took item nr 19 and 20 (one is the typical bun cha, with pork spring rolls and shredded pork, and the other one is the vermicelli bowl with sweet lean beef). The portions are huge, the meat portion is very generous, and the everything is really fresh. The fish sauce might be a bit strong in terms of taste for some, but it is really nice and special, too. The interior of the restaurant is very simplistic and spacious, the staff friendly and efficient, so overall if you happen to be in Surrey Quays and don’t necessarily want to eat at the giant Tesco or at Pizza Hut, go to café East and treat yourself for less than 15 pounds all inclusive! Excellent food, although Vegetarian choices are very limited. The restaurant was FULL of local Vietnamese people, which speaks volumes. The bizarre desert/drinks are well worth trying if you're adventurous and not put off by the idea of kidney beans in a milkshake. I'm looking forward to eating at Cafe East again soon. Best Vietnamese food in London. Just bit far out. Cafe East has been a regular restaurant for me and some of my friends and families to visit since we moved to the area back in 2010. When we first came here, the first two years were fantastic. Even families that came over from back home really liked the food and service provided. I still remember the waiters and waitresses that used to work there 2 years ago. However, recently, and I mean quite recently... about a week ago and this week, I've had really bad experiences there. It wasn't the food. It was the service. There are a few new waiters I've only started to notice recently. One of them had a row with my dad last Friday night, whom he shouldn't have retaliated to. My dad was basically expressing his thoughts on how rude he was being - he was explaining halfway to the waiter that there were 7 of us, and common sense was that, 3 tea cups weren't going to help, but the waiter decided to go on and on about how it's £1.50 per person, when we clearly knew and that did not bother us at all! All we wanted was a cup each because it was late and everyone was tired and hungry; And this waiter walked away midway to serve other customers, as if he could not be bothered with us anymore. After being told how rude he was being, he told my dad "you are just a customer, you are not my father". That was uncalled for. I work as a pharmacist and I deal with customers every single day, and I damn well know what customer service is all about. This waiter (with spikey hair and glasses - I wish I knew his name) clearly did not practise such customer service and do his job properly. If anything, he should have only apologised and get on with his job and take in whatever criticism and negative feedback. If he cannot accept such things, he should not be working as a waiter. I hope he reads this because he does have an attitude to improve on. This week I brought a friend along with me. She ordered a bowl of noodle soup, and when the waiter brought it to her table, he did not bother to go around to her side and put it down gently, instead he signalled and asked her to "give me your hands" so that she could take the bowl herself. Can you imagine such gesture? Even if he said "could you please help me with taking this bowl of noodle soup as I can't reach you" politely, that would be totally fine, but he had to just snap "give me your hands". Disgraceful. It's been a disappointing week at Cafe East. It used to be a restaurant for me and my family to look forward to almost every week, but recently that has changed. I strongly advise the owner to review his staffs in order to maintain the quality of this restaurant. For those who plan to go there, do be aware and don't expect polite waiters to serve you. We've been coming here for years, and have always loved it. But our meal this evening was well below par - our starter course cold dumplings were chewy and dull, and the seasonings on our main courses weren't as subtle as usual - though everything was fresh enough. I got the impression that, with the new menu, they might be skimping on ingredients a bit. We'll probably come back, but if the food is like this again we won't hesitate to take our appetite for Vietnamese elsewhere. Fortunately there's some choice in the area nowadays. It used to be good but the last 3 times we have been there we feel that the quality and standards of the food has dropped significantly. The broth now tastes like it is from stock cubes and the grilled pork doesn't taste like it has been marinated and definitely not grilled. Microwaved perhaps???? We will NEVER go back again and will warn of others not to go. I'll try to be objective. As you walk in your greeted with two signs, one informing you that it's "cash only" necessitated a trip to a local cash-point, and "We do not serve tap water". That probably tells you all you need to know about the ethos of the place. There's no license and you cant BYO so your condemned to £2 cans of coke or bottled water, this wound me up a little. The cash only rule is I suppose great if you're running a restaurant and want to be a little discreet on the taxable takings... The food is the point of this place though, the starters were excellent, the mains a little heavy on the shredded lettuce (the hence the larger portions others mention) but I'd rather quality over quantity. Pricing is OK with starters at £5 mains at roughly £7-8. One starter is easily enough for two. The atmosphere was busy and too loud, but perhaps I'm a delicate flower. All in all I don't think I'd bother to drive through the Surrey Quay's badlands again and even if I lived round the corner it would be a last resort. I've been visiting for a good few years, from when it was at it's old location and now. Sadly, I've found that it can no longer compete with a lot of the Vietnamese restaurants around Kingsland Road. The service has also gone downhill. Each member of staff is rude and stand offish and very eager to clear away your plates even if you still have half finished bowls in front of you. After our mains we decided to order another main and some desserts to share with another round of drinks. Inbetween, the waiters kept pestering us with a bill and when told that we have not finished eating acted surprised and annoyed. It's a fairly small restaurant and with adequate staff it's still a chore to get noticed to put your order through. Most restaurants will check up on you within a few minutes of being seated, sadly not at Cafe East. The worst part of the experience is the staff, I noticed the approach each customer in the same way. While I was there, another customer accidentally spilled some water and the waiter huffed, returned with one or two paper towels and handed them to the customer to clean up. We'd wanted to try Cafe East ever since a good review in Time Out. It's local, serves a type of food we enjoy & could have become a reasonably regular haunt. First impressions were "OK". Decor is bland oriental canteen style - 4 long rows of tables, brightly lit - menu has reasonable range of tasty sounding dishes & staff fairly friendly. Starters were good. The main courses less so, 1 had very fatty beef & the waiter was unsure which was the spicy version of a dish ordered by 2 of us - actually it didn't matter as I couldn't really tell even by tasting them. Overall, the food was "OK", but not nearly as good as some Vietnamese places a couple of stops along the East London line in Dalston. Although not expensive, it's certainly not cheap for its quality. However - the place showed its real colours when we had cause for complaint. As our 8 year old had not liked, nor eaten, the (fatty) beef dish she’d chosen, we ordered another portion of 1 of the starters that she’d really enjoyed - Banh Cuon, steamed rice pastry pork & mushroom rolls, which come in 2 layers. We shared the top layer, it was ok but not as good as the 1st portion, there were less mushrooms. However, the 2nd layer was very greasy, covered in oil & slimy & really not pleasant. Had this been our 1st portion, we would certainly not have ordered again. We asked them to replace the remaining rolls, as they were inedible. The waiter took them away, returning a few minutes later with the same plate saying all their dishes were made with the same batch of filling & properly prepared, so there was no fault & they wouldn't replace them. We finished our meal & asked for the bill, leaving the offending items untouched. We asked for them to be removed from the bill - it was only £5.50, but I don't expect to pay for inedible food. After discussion with 3 or 4 members of staff we were told there was nothing wrong with them & anyway we should have complained before we'd eaten half, so we had to pay for them. We asked to see the manager. That didn't help. A rather aggressive man emerged from the kitchen, supported by a less aggressive, but equally immovable woman & constantly repeated the line that their staff had proffered. From several comments he made, he clearly holds a strong view that most of his customers arrive intending to rip him off. Perhaps we should have been warned by the prominent "We don't serve tap water" & "Cash Only" notices. We paid the full bill & left - amazed that they would rather drive away future business than acknowledge that our position as a customer might deserve something other than disdain & distrust. Perhaps it’s the lack of competition in Surrey Quays that allows them to get away with it. Sadly our message is this: if you're ever tempted to visit Cafe East – Don’t! 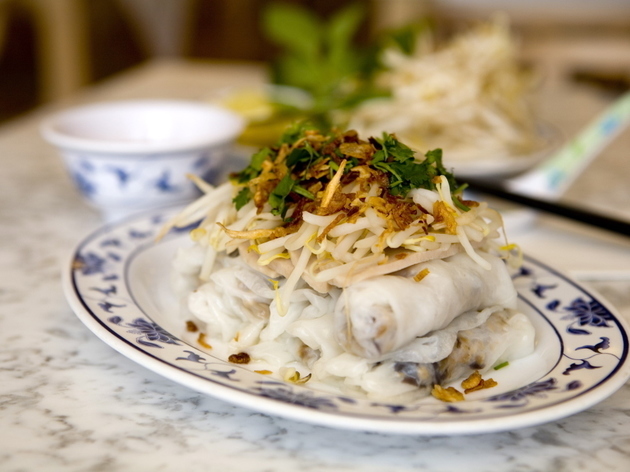 Instead, get off the East London line near Kingsland Road & enjoy some truly excellent Vietnamese food & service. There are several very good places to choose from & cheaper too! No tap water, no beer, no atmosphere and average food. Service is good but generally this place is massively overrated. Go to Kingsland Road if you want good cheap Vietnamese. I do enjoy the beef pho everything time I go here, having spent time in Vietnam it is very authentic. The one big mistake in my book, and I do think its bad, is they wont serve tap water, their own drinks are very sickly and sweet. First time here, and I will be back. The starter (rolls with prawn and pork) was tasty and filling, and the mains came in large-ish portions. My friend's pho with prawns was good and my spicy dry rice noodles had the right amount of chili. The service was efficient and friendly enough. Fantastic food and friendly staff. Prices add up fast and for a cafe style eatery they are only just acceptable. They could do with a week day lunch special. The currys are sublime. Having been to nearly all the Vietnamese restaurants in London, Cafe East is the best at what it does. Authentic, cheap Vietnamese Street food. The Banh Cuon is lovely, and whist not strictly authentic, the Spring Rolls have a lovely flavour. Highly recommended.